Rafa had a look at Ian Rush as coach - LFChistory - Stats galore for Liverpool FC! Liverpool manager Gerard Houllier recognised Ian Rush's coaching ability and added him to his staff to teach his strikers how to score goals in January 2003. Houllier said at the time: "I hope he will be here to help the players for a long time." 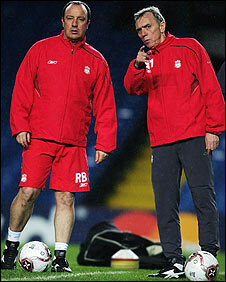 Houllier left Liverpool in the summer of 2004 with Ian Rush still working for the club. When Rafa took over as manager, big changes were made to the coaching staff. Assistant manager Phil Thompson left and first team coach Sammy Lee decided to leave Liverpool to join England's coaching staff full-time. Rafa decided to bring in his own staff, but a promotion within the club was also on the cards. Rafa needed a first team coach and Liverpool's greatest ever striker was one of the possibilities he was looking at, which prompts this very question to Ian Rush: Did you get an offer to work under Rafa? "When Gerard left I was still part-time with Liverpool with the strikers. I was in Australia when Rick Parry rang me to say would I be interested in maybe working with Rafa Benítez and being on the bench vs Wrexham in a pre-season game? I would have given anything for that. I said, 'Do you want me to fly back from Australia?' and he said no. 48 hours later Rick rang me to say that Alec Miller is going to be doing it now. I was disappointed, but that's the way the world works. After being on a high since Rick Parry rang me then 48 hours later saying it's not really going to happen now. Every manager needs to have their own team to work with and Alec Miller was on trial for three months to see how it went and he stayed there for quite a bit." Scotsman Alec Miller, who was Director of scouting under Houllier, got the job and stayed until May 2008 when he was appointed manager of Japanese club JEF United Chiba. It is clear from talking to Rushie that he would love a return to Liverpool in some capacity. Rushie is currently Elite Performance Director for the Welsh Football Trust, a part-time role in which he will help develop the next generation of players for Wales' national teams.